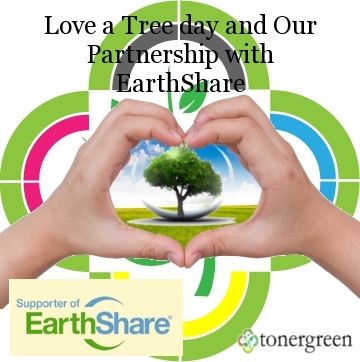 Love a Tree day and Our Partnership with EarthShare | TonerGreen - Eco-Friendly Toners from the U.S.
A wise man which goes by the name Buddha once stated how trees are one of the most loving organism there is. According to him, "a tree is a wonderful living organism which gives shelter, food, warmth and protection to all living things. It even gives a shade to those who wield an axe to cut it down." A simple but meaningful quote it is. Trees are very important to our lives no matter how simple they might appear to you and your everyday life. They play a significant role in producing oxygen and reducing the carbon dioxide in the atmosphere, and moderating the ground temperature. They are also elements in landscaping and agriculture, and considered as a reliable building material as well. From up to its leaves up down to the end of its very roots, these trees have been sustaining our different needs since the beginning of time. Why don't you take a time out and appreciate it? Isn't it just fair if we give some love back to these trees? Well, every 16th of May, a special celebration called "Love a Tree Day" brings you the chance to let your inner hippie out. This is the day that environment-conscious individuals show their love for these magnificent green beauties. But this doesn't mean you have to literally hug or kiss the tree in the backyard. You can do simple things like watering it, trimming that small tree in your front yard or better, go out with your family and enjoy a day joining a tree-planting program. There's are lot of ways to show your love for these trees. Start appreciating them now because you in yourself know that we couldn't live without trees, and we just take them for granted, so maybe its we give them the attention they truly deserve. TonerGreen.com, your online provider of eco-friendly toner cartridges and environmentally responsible printing solutions, support "Love a Tree Day" and other Go Green campaigns. That's why we partnered with EarthShare Organization. EarthShare is an environmental organization that manages workplace-giving campaigns for its national environmental charities. This is the organization's way of raising funds to support environmental programs around the globe such as World Wildlife Fund (WWF), Sierra Club Foundation and National Wildlife Foundation. You too can share and help EarthShare make this world a greener place to live in. For every purchase at TonerGreen, 1% goes to EarthShare. It's TonerGreen's commitment to conserving the environment and to building a better future.